The 12 string guitar has become common place in music history. Though its use has waned lately, it is still a mainstay with guitarists and most prominent players include at least on in their collection. For many years dating back to the 1600’s, guitars were double course instruments, generally with 10 strings made of dried animal gut. Double course means two strings are tuned to the same pitch, which meant these older versions had 5 courses (double strings) much like our modern 12 string guitar, which can be considered having 6 courses. 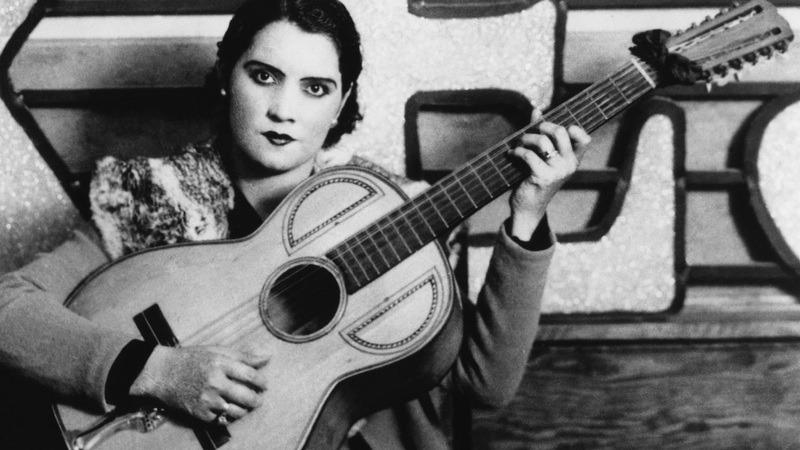 The 12 string guitar probably had its origins in Latin America. South American builders came up with a variety of guitar variants. These would include the tiple, the charango and the cuatro, though not all had 6 courses of string. On the other side of the world 5 course citterns, bouzoukis and 11 string ouds were gaining favor. Possibly the first mention of a 12 string guitar was from the musical instrument company Lyon and Healy, which offered some “Mexican-style” instruments with 11 and 12 strings as early as 1905. These guitars were unique in that the had 3 courses of treble strings that were tuned identically and three (or four) lower strings that were tuned in octaves. Another company of that same era called Grunewald introduced a 10 string guitar they called The Harp Guitar, advertising that it had twice the tone of any guitar. It would not be until the Folk Era of the 1960’s would any of the well known guitar builders produce well made twelve string guitars. The early Blues players were the ones that influenced the popularity of the 12 string guitar. Blind Willie McTell and Leadbelly both played inexpensive 12 string guitars made by Stella, which was a part of Lyon and Healy and later Chicago Musical Instruments. A pretty young lady may have been the first to show interest in the 12 string guitar. In 1916 in Texas a young lady named Lydia Mendoza had settled with her family in the town of San Antonio. The family had formed a band, but Lydia found she could make more money on her own singing solo. She had a very loud, but pretty voice and chose to play a 12 string guitar to complement her style. After Leadbelly passed away in 1949, there was no longer a champion of the 12 string. 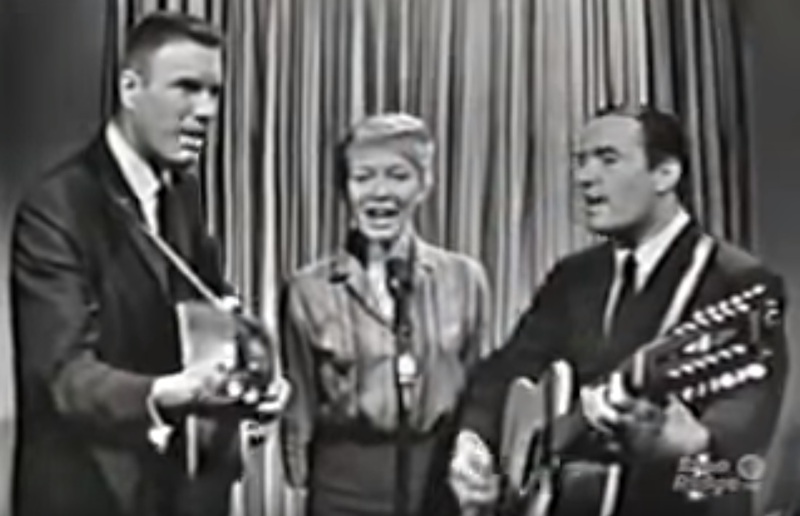 That is until Pete Seeger came along. 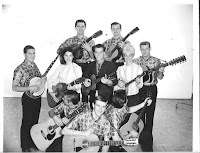 Though Pete is primarily known for playing his long necked Ode banjo, he also played the 12 string guitar. He figured this was his duty to carry on the tradition. Pete played this unusual instrument throughout the 1950’s and into the 1960’s with his group, The Weavers. 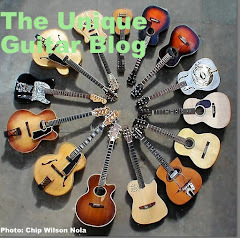 The 1960’s brought on the Folk Revival and well established guitar builders began to take note. 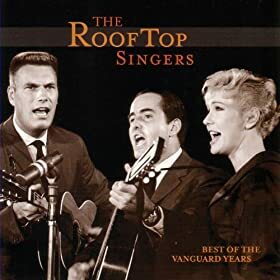 The Rooftop Singers had a hit recording called Walk Right In. The two guitarists in the group, Eric Darling and Bill Svanoe both played the Gibson J-12-45’s that were featured on this song. This song did a lot to promote the 12 string guitar and it’s big booming tone. Many of the folk singers of the 1960's were influenced by Reverend Gary Davis. In fact someeven took lessons from him. Reverend Davis preferred his Gibson B-45-12 string. 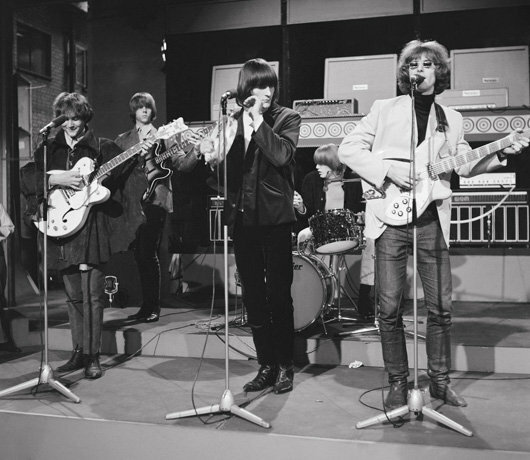 Roger McGuinn of the Byrds laid down some 12 string solos on his Rickenbacker model 360. George Harrison did the same on many Beatles songs. The one that comes to mind is A Hard Days Night. I suppose the first time I saw a 12 string guitars was when The New Christie Minstrels were singing their hit Green Green. The hit song had a brief 12 string run. I was hooked and I had to have one. Such guitar greats as Glen Campbell, Roy Clarke and Leo Kottke began playing 12 strings. Kottke was the newly crowned king of the 12 string. 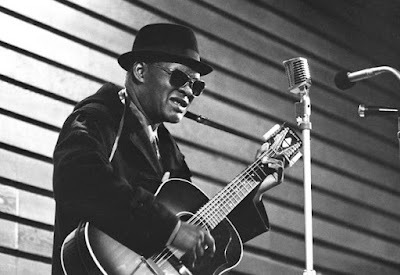 He took a cue from Leadbelly and tuned his guitar strings down to where the bottom string was C#. Those old Stella guitars that Leadbelly played couldn’t stand the strain on their necks of standard tuning. 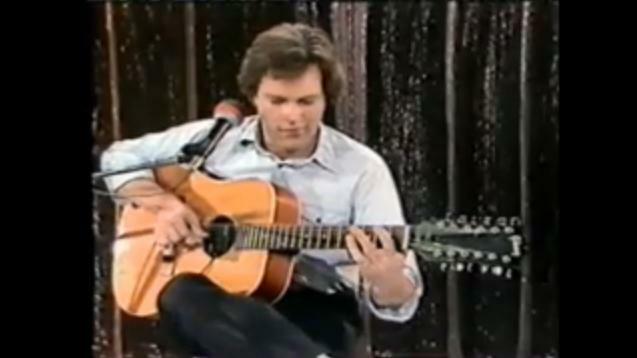 Leo Kottke made his old Gibson B12-25 sound like an orchestra. As I have stated, the 12 string guitar has waned in popularity recently. 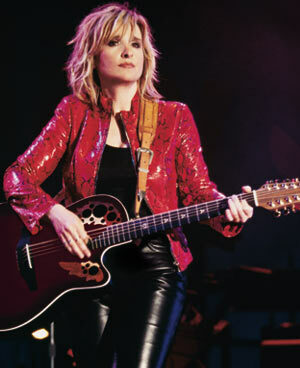 Kurt Cobain played one and Melissa Etheridge plays a 12 string. Perhaps the reason it has lost popularity is because guitar synthsizers are able to synthesize the 12 string sound, with only the effort of play six strings. I believe it is a beautiful sounding instrument when played by the right person. Over the years I have come across some 12 string oddities. These were especially prominent in electric versions of the mid 1960’s. Here are but a few. 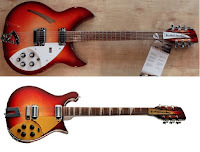 The Rickenbacker 12 string electric guitar, which includes the 330, 360,370, 420, 620 and 660 models were very eye-catching when the hit the scene back in the early 1960's, and have since become one of the most common 12 string electric guitars ever used by performing musicians. So what is so unique about this instrument? The clue lies in the design and ease of production. 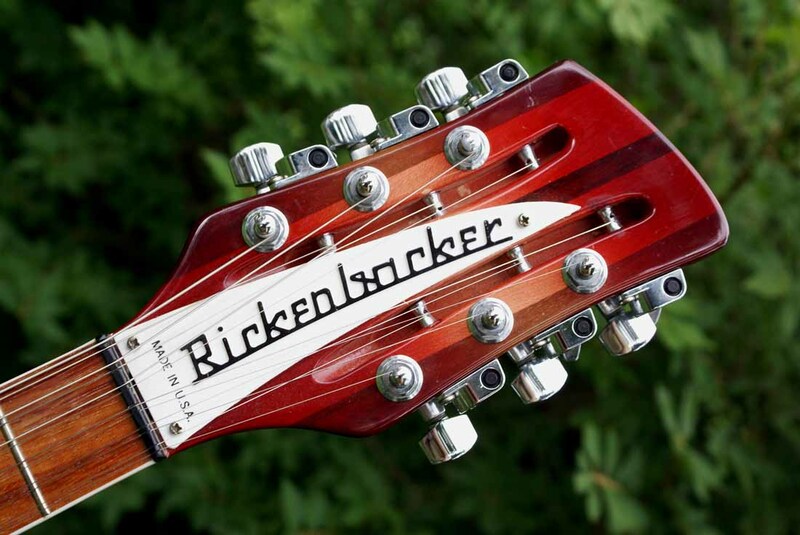 All Rickenbacker guitar necks are the same size; 1.931". It matters not if it is a six or twelve string neck. They are cut out of the same wood, laminated the same way, cut the same size and given the same style of head stock. The only complaint I have ever heard about a Rickenbacker 12 string guitar regards the narrow string spacing. I've played my friends 360/12 and in my opinion it plays like a six string. You don't feel the pressure that comes with some twelve string guitars. 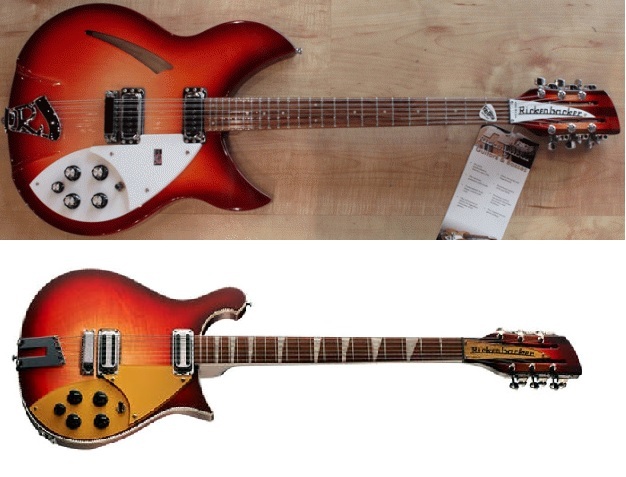 So Rickenbacker does not have to build differing sized or shaped necks. This is a plus for a manufacturer. It stands to reason if all Rickenbacker guitars with the 300 or 600 model designation have the same size necks they will fit in the same size case. 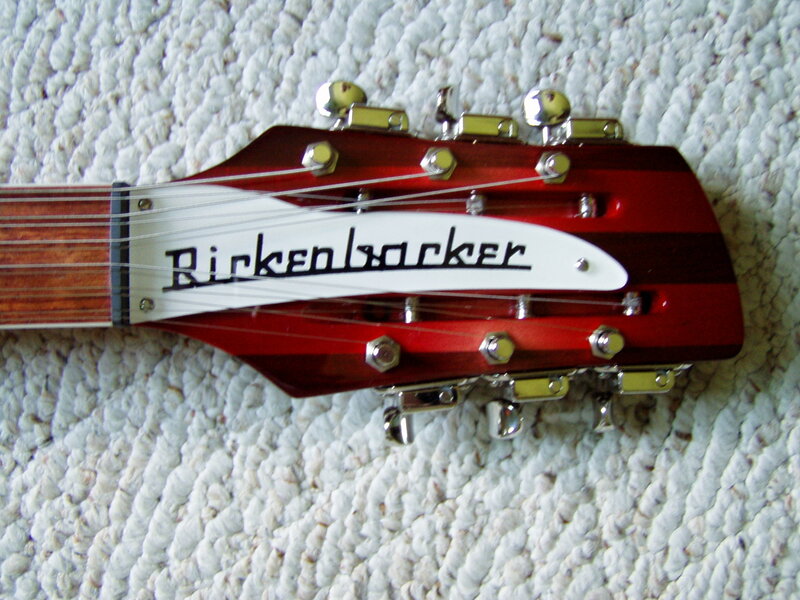 This is another well designed win for Rickenbacker. Most 12 string guitars begin with the .027 string on the 12 tuner, the the .047 on the 11th tuner. Rickenbacker has reversed this so the thicker .047 string goes on 12th tuner and the .027 goes on next. This too is functional, since it is easier to fit the smaller string into the routed area on the head stock. It is too bad that Fender no longer builds the Fender XII. It was a great guitar. 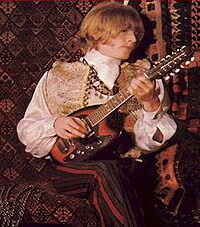 A lot of the session players preferred this guitar over a Rickenbacker, because of the easily adjustable bridge. This made tonality a breeze. Nothing against Rickenbacker, but the bridge saddle design of a Fender XII seems to be superior over the Ricky's adjustable bridge saddles. Another plus for the Fender XII is re-stringing the guitar. Those Rickenbacker 12 string owners soon learn that you remove only one pair of strings at a time. If you take all the strings off, it is very difficult to get the strings to hold on the "R" tailpiece. It can be a all day ordeal. The Fender XII (for those that are not familiar with Roman Numerals that is X for 10 and II for 2), like most Fender guitars string from the back, through the body. 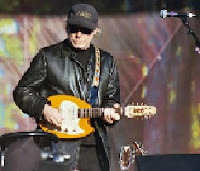 To name couple of songs that utilized a Fender XII on the recording would include Stairway to Heaven and the opening line of the Beach Boys Wouldn't It Be Nice. To top the Fender XII off is its so-called "hockey-sticky" head stock. Fender made these twelve string models from 1965 to 1969. Perhaps the other unique feature on the Fender XII is the pickup arrangement. This guitar took a cue from the Fender Precision Bass with it's staggered pickups. So Fender's 12 string actually had four pickup bobbins, each was spit into 3 pole pieces and each wired in series. This gives the impression of two for the bottom six strings and two for the top six. 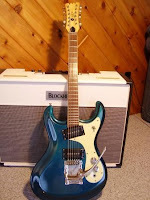 The four way selector switch provided the neck pickup, the bridge pickup, both together and something Fender called a deep sound which was neck and bridge together with a phase inverter. Fender went on to design some other 12 string guitars, but none so unique as the Fender XII. Back in November of 2009 I profiled the Giannini CraViola. For those not familiar with the Giannini Guitar Company, it is the largest manufacturer of guitars and ethnic stringed musical instruments in Brazil and is located in São Paulo. 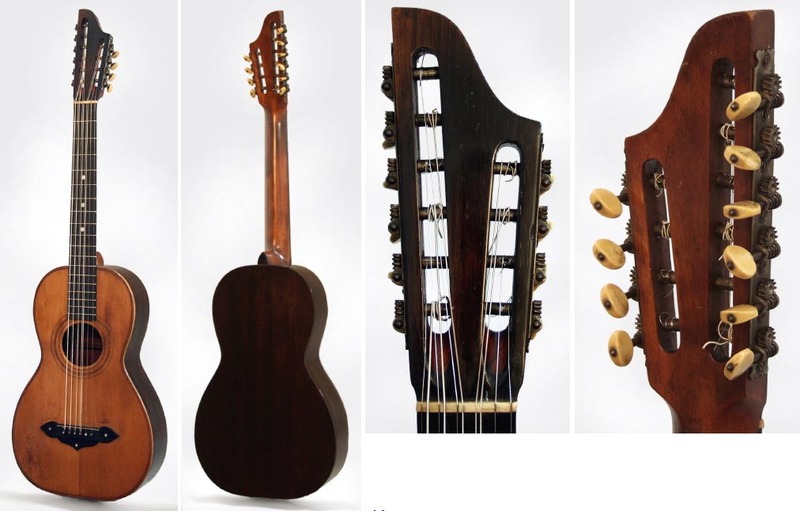 The CraViola was designed for Brazilian guitarist Paulinho Noquieria, who played and composed music with Tom Jobin and Vinicius de Moraes. The US and Europe became acquainted in the early 1960’s with Brazilian Music by interest in a dance called the Bossa Nova and the song that Jobin and de Moraes wrote called The Girl From Ipanema. Jump forward but a few years and the Beatles introduced the Harpsichord to modern music. 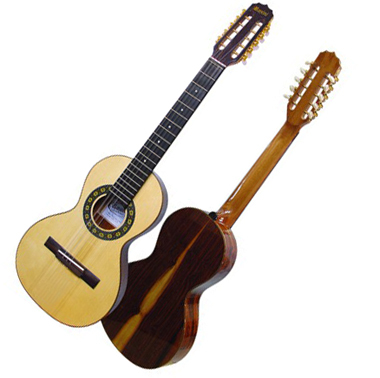 Noquiera was looking for a guitar that would combine the traits of the harpsichord with a Brazilian musical instrument called the Violacaipira. This is a small ten string instrument that has five courses of nylon strings that are tuned to A-E-F#-B-E. Due to the instruments small size it has a very bright sound. The Giannini Company came out with a 12 string assymetrical guitar that combined the qualities of both of these instruments. The Portuguese word for harpsichord is Cravo. This is derived from the Italian word, clavaciembela which in English translates to clavichord which was a small version of a harpsichord. As previously mention the Viola Capira was shortend to Viola and you put them together to get CraViola. 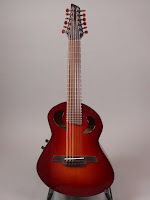 The CraViola was first built in 1969 or 1970 as a 12 string instrument, but also was manufactured as a 6 string steel guitar and a 6 string classic guitar. Because of it’s unique shaped the 12 string version has a very bright sound. Giannini still makes these guitars and imports them. 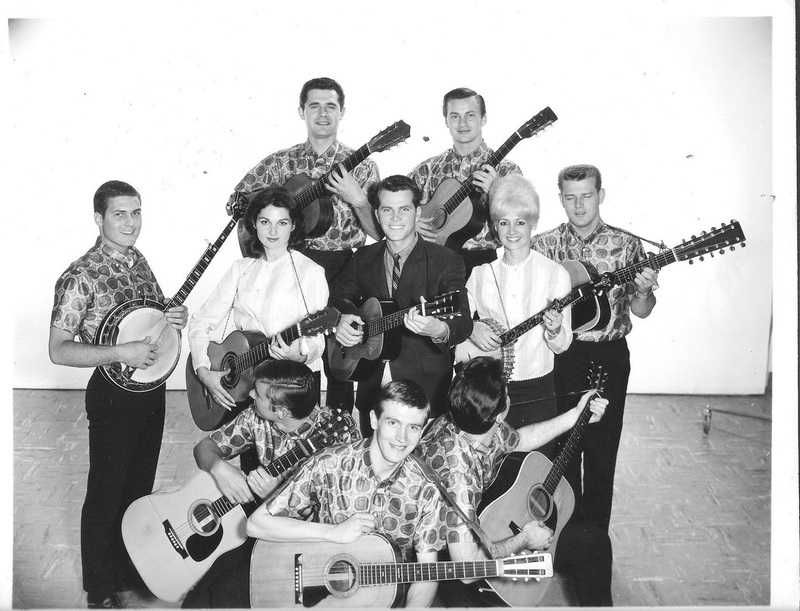 The originals were made with laminated spruce tops and laminated rosewood back and sides. These days you can purchase models with a solid top and laminated sides or a high end model that is made totally of solid wood. Years ago a local music store had a 1982 DY87 Yairi Alvarez Double Neck 12/6 guitar in the window. I had to go in to play it. It was a thing of beauty. It looked great and most importantly it sounded great. As I recall the necks were well set up and the action was low. The body was 17” wide, which is about the same size as a Gibson J-200 jumbo guitar. I am assuming the top was solid spruce. I am not certain about the back and sides. The neck appeared to be mahogany. The upper neck was the 12 string and the lower neck was the six string neck. The strings shared a common very large sound hole. The guitar came with a specially made case. Between 1979 and 1982 Yairi only made about 100 of these guitars. So they are quite rare. I wished I could have bought it, but the dealer wanted $950. That was a considerable amount of money in 1982. Can you imagine changing 18 strings? 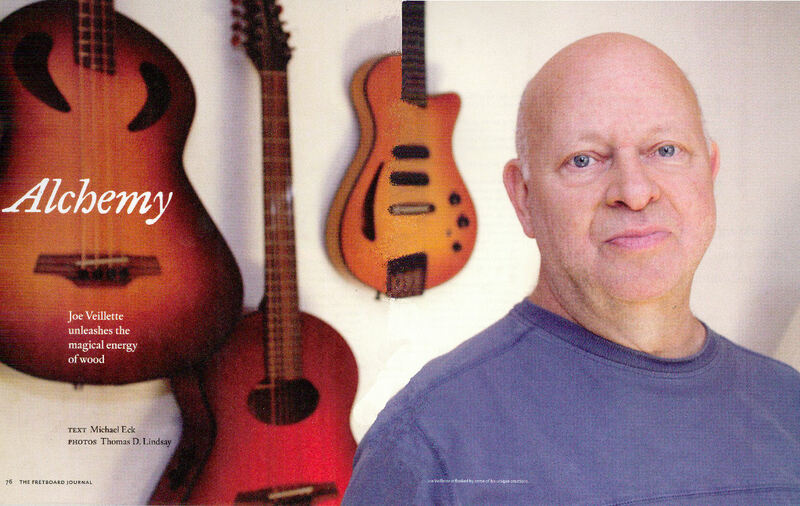 Joe Veillette is the owner and luthier of Veillette Guitars of Woodstock New York. He specializes in the crafting of unusual handmade guitars, basses, and other stringed instruments. He has created some of the most unique guitars and basses ever. One of Veillette's most notable guitars is the HD 12 Gryphon, which is an 18.5 scale, 12-string guitar that can be played to sound like a mandolin. 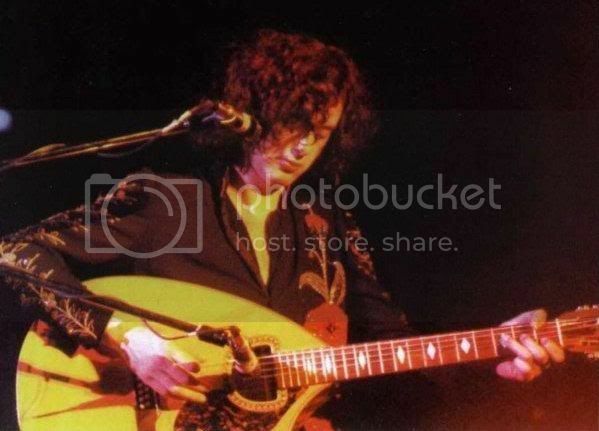 Though it appears to be a small scale 12 string guitar, it actually in more of a mandolin. Instead of having strings tuned in octaves, the HD 12 Gryphon has 6 courses of strings. This means it has 12 pairs of strings that are tuned alike. The instrument is designed to be tuned so the twelfth and eleventh strings are tuned to D (equivalent to the 10th fret of a normal guitar). This is made possible by the short neck, so that the Gryphon plays in a higher register. The sound is clean and articulate and of course it is handmade and well designed as are all Veillette instruments. In 1966, Semi Mosely introduced a production version of a double neck guitar that was available for only a few years. 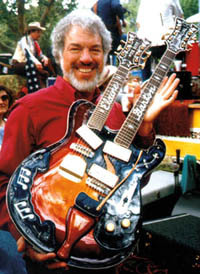 Although it appeared nothing like the double neck models he created for Joe Maphis, this guitar was a double neck and thus was dubbed The Joe Maphis Model Double-Neck 6/12 String Guitar. The six string neck was in the lower position and the twelve string neck occupied the upper portion of the guitar’s body. The twelve string neck was a mere 2/16th of an inch larger than the six string neck. Both 22 fret necks came with a 24.75” scale. The two piece body was made of alder and had the German carve that adorned most Mosrite guitars. The necks bore the M design on the top and both featured a Mosrite logo. The tuners were made by Kluson. The six string portion of the guitar came with a Mosrite Vibrato tailpiece. The 12 string section had a stop tailpiece. Both came with an adjustable bridge. 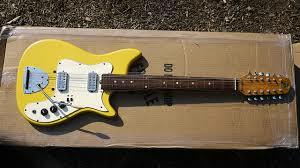 The guitar came with four Mosrite single coil pickup that were wound to around 10.42k. 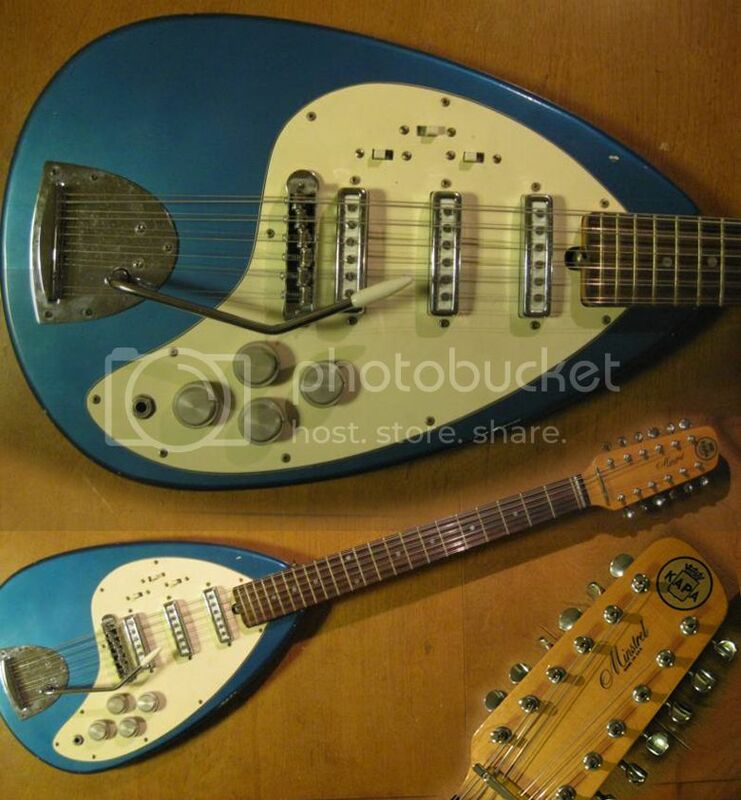 Mosrite also offered a few twelve string guitars with vibratos. 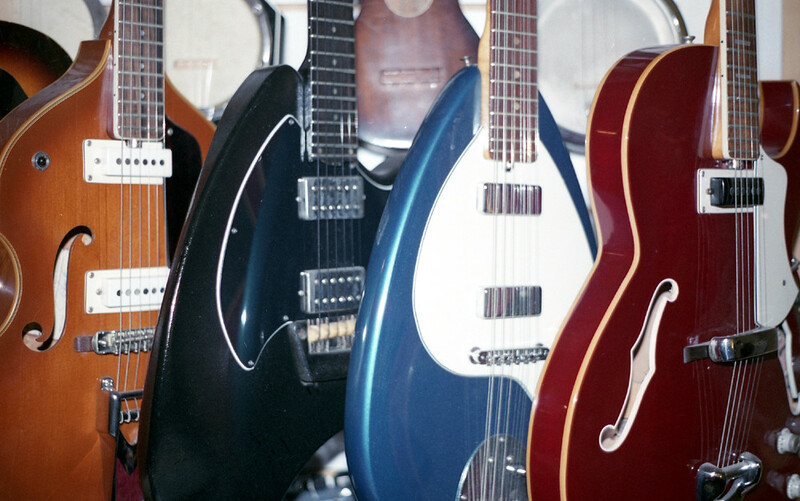 A small music store owner from Maryland took on the guitar craze and produced some mighty fine guitars. 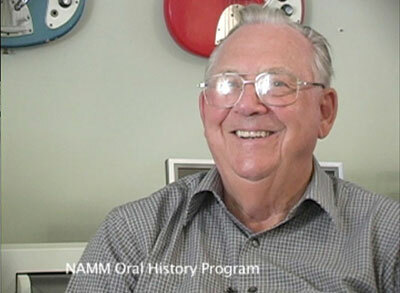 Koob Venemann, the owner, figured he could make a guitar as good as some of the guitars that he sold at his store, and he did. 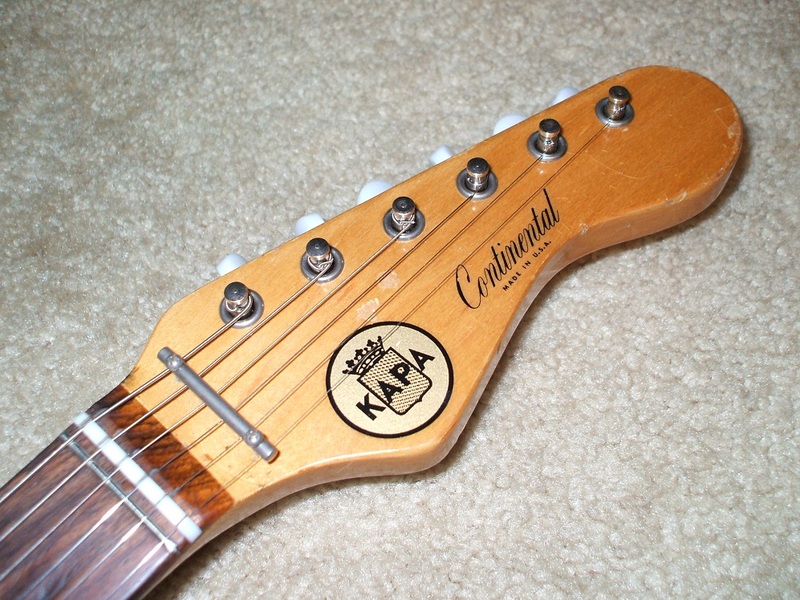 Kapa made two versions of twelve string guitars. First was the Continental version, and next was the Minstrel. The Continental came with a semi-Fender style body. Venemann made all the bodies, and painted them at his business in Edmonston, Maryland. However the necks, pickups and electronics were supplied by the Hofner Guitar Company of Germany. Schaller, another German firm, made the tuners. 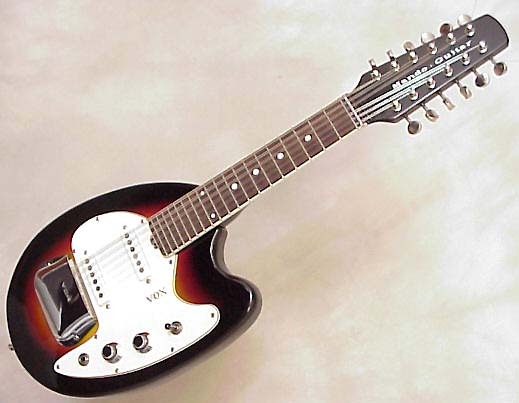 The Minstrel was a tear-drop shaped model, similar to Vox’s guitar of the same time period. It also was offered as a 12 string guitar. 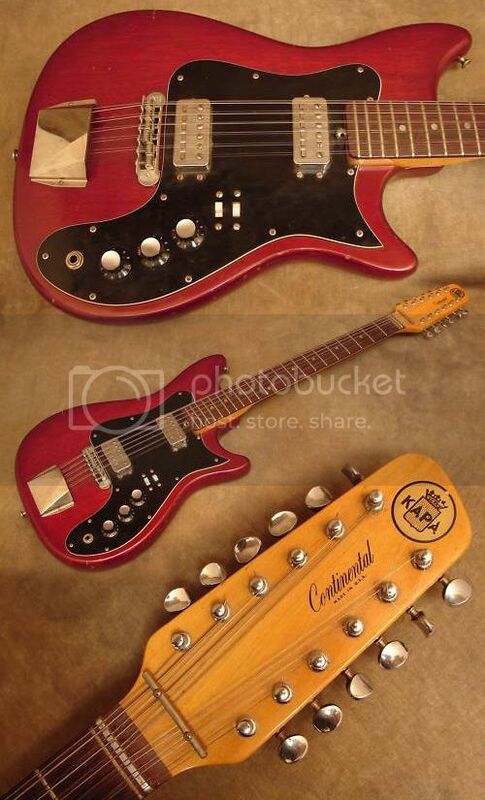 The Continental came with two ‘foil or staple’ single coil pickups (I’ve heard them with both descriptions.) The Minstrel came with two to three pickups. 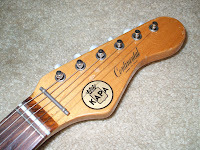 The odd thing is many of KAPA’s twelve string models had vibrato units. I borrowed a Continental Twelve when I was a kid playing in a garage band. As I recall the neck was well made and set up. It played like butter. A friend owned a twelve string Minstrel. It was a great player as well, but was not as easy to play when seated. Another twelve string guitar that I will mention is the Vox Mando Guitar model V257. This is a very short scale twelve string guitar that was made by JMI from 1964 to 1968. It is tuned up an octave from a regular guitar. The instrument's lower bout resembles the Vox Phantom; however the upper bout includes a rounded cutaway. The instrument appears to have 18 frets and joins the body at the 12th fret. The neck is bolted on the body. The majority of these were Italian imports. The head-stock declares this to be a Mando Guitar. There is a small Vox imprint on the pickguard. These instruments came with twin single coil pickups, a volume and tone control and a toggle switch. I have heard Buddy Miller use one of these in concert and I have to say it provides a clear ringing sound unlike any mandolin I have ever heard. 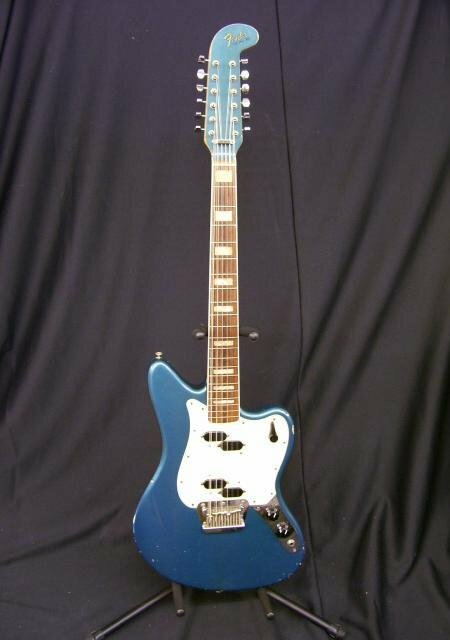 You could probably pick one of these up for around $1500, but Phantom Guitars offers a fine copy that could be purchased for less. 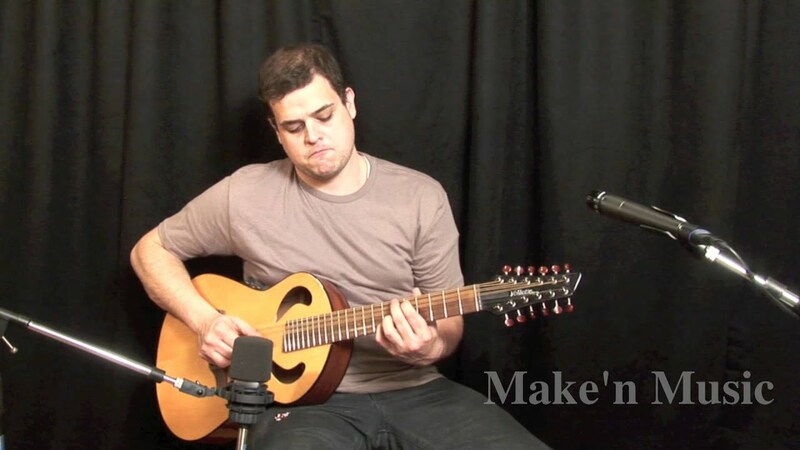 Luthier Nikos Apollonio makes folk instruments and guitars for a living. He lives in Maine and formerly was a ship builder. 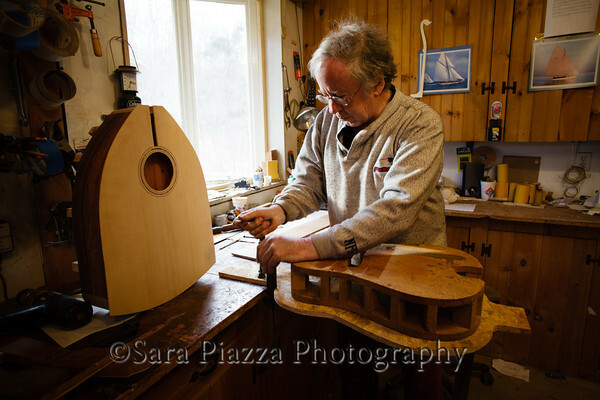 His instruments are entirely handmade and available directly from him on his website. From time to time he offers instruments on sale on eBay. 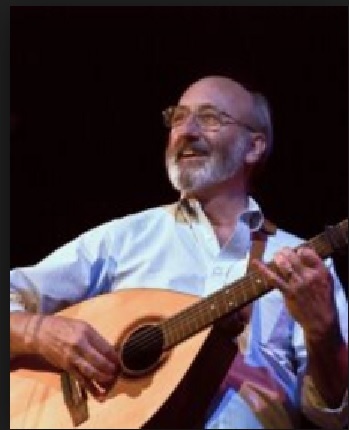 I have mentioned Nick a couple of times on this blog because he designed and built Noel Paul Stookey’s unique twelve string guitar. Stookey’s instrument is in fact not a guitar, but a cittern. 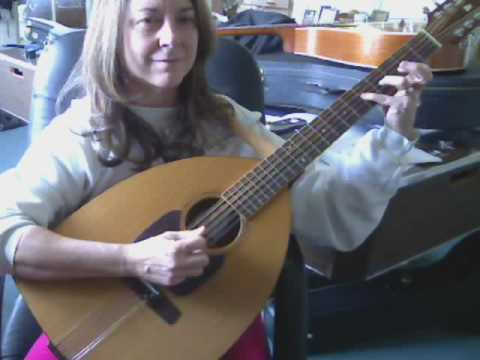 A cittern is a ten string instrument used mainly in Celtic music. There are a number of tunings on this instrument, however most of them are variables of one-four-one-five-one or one-four-one-four-one. (DGDAD or DGDGD) as well as other tunings. Apollonio offers two versions of the cittern. One is a tear drop-traditional model and the other model is very unique one that he calls a Bell Cittern. At Noel Paul Stookey’s request he built a twelve string cittern for Noel Paul Stookey that was played on the Wedding Song. Nick suggests that you tune down and do not tune to an E. This has nothing to do with structure and has everything to do with getting a rich and vibrant sound. On the Wedding Song Stookey tunes his cittern/guitar down five steps to C. It rings true like a cannon. Nick will make you one upon request. I can promise you that Nick Apollonio’s instruments are totally handmade of solid wood from the American North East. A friend of mine on Facebook turned me on to this unique device. 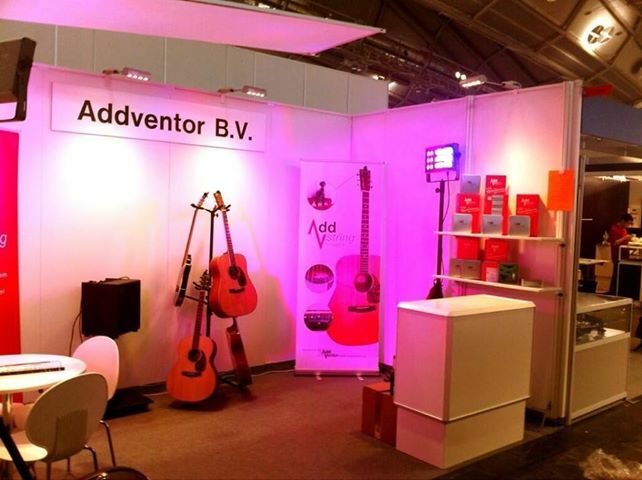 It was first demonstrated at the Musikmesse 2012 music dealer conference. What appears to be just a .009 guitar string and some bits of plastic, is actually an extremely well thought out device. Perhaps some of you may remember back in 2005 Martin Guitars introduced the Roger McGuinn model HD-7 seven string acoustic guitar. To play like McGuinn, understand for his 12 string guitar solos he mainly utilized the G strings which are tuned an octave apart. Martin designers understood this and worked with McGuinn to design an instrument with a normal G string and another string tuned an octave higher. This allowed Roger McGuinn to play his solos on a six string-like guitar, but get that extra high note on the G strings. Merle Travis also used this same feature on a few songs that he recorded to achieve a richer sound on his recordings of Black Diamond Blues and Beer Barrel Polka. Along comes the Addstring device. This allows anyone to attach a .009 G string to any guitar by means of a few easy to use attachments. These attachments are easily removable and will not permanently harm your guitar. Rather than attempt to explain all the parts of the Addstring, I will let you watch the video. 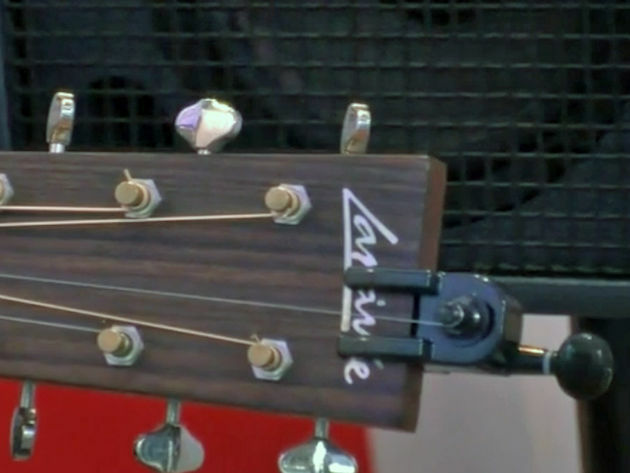 One unique feature is the small bit that fits alongside the sound holes edge that allows the player do damp the high G string when not in use. 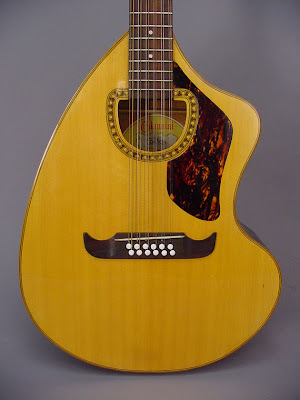 If you can find a Martin HD-7, Roger McGuinn model, it will set you back around $4400 USD.